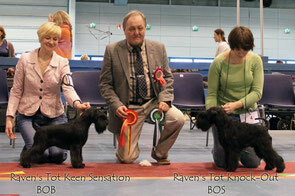 Today in Lahti Int.show (Finland) Raven's Tot Knock-Out was BOS, with CAC and CACIB, his sister Raven's Tot Keen Sensation went BOB with CAC and CACIB! Thank you Tatiana and Virpi for taking great care about little ones. Thank you my friends for congratulations and to judge Benny Blid von Schedvin for so high appreciation of our dogs!